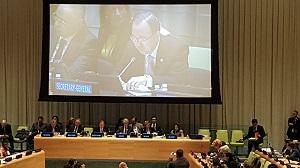 UN Secretary General Ban Ki-moon spoke on the event's opening panel. Last week then UN held a meeting for NGOs concerned with drug policy -- the "Interactive Institutional Stakeholders Consultation " -- as one of a series of events leading up to this April's "UN General Assembly Special Session on the World Drug Problem" (UNGASS). The event was not recorded, but the following is approximately what I said during one of the panels. More information on the concepts discussed here can be found at http://stopthedrugwar.org/global . Thank you. My name is David Borden, and I'm the executive director of StoptheDrugWar.org. We support the calls that have been made for harm reduction and the decriminalization of users, and for people-centered approaches. But it's important to remember that the harm we seek to reduce is not only from drugs, but also from drug policies. Criminalizing the drug trade drives users into an underground where drugs' quality and potency are uncertain. The high price of street drugs causes life destabilization for addicted users, often in ways beyond the effects of the drugs themselves. The criminalized environment encourages high-risk behaviors such as the sharing of syringes, or resorting to prostitution or becoming homeless because of the financial cost. Illicit drug profits fund transnational criminal organizations, as well as low-level street crime that fuels poverty, social instability and violence. And so along with pursuing these necessary objectives for drug policy that many of us have talked about – human rights, development, health and security – in fact in order to pursue them more effectively, we urge that this UNGASS consider alternatives to criminalizing the drug trade, and the changes to the drug conventions that can codify such alternatives as legitimate. We likewise urge that the UNGASS consider how nations' obligations under the drug control conventions vs. human rights treaties should be balanced, in cases when those obligations conflict. We also support a proposal offered by several nations for an UN Expert Advisory Group to assess the tensions in the international drug control regime and present options for moving forward.